Delmonico’s turned 180 years old this week, and its current incarnation turned up and turned out in style to celebrate the amazing milestone with Gilded Age celebrities, costumes, and food. Granted, one hundred and eighty years means that despite the grand restaurant being synonymous with the Gilded Age, it was founded well before the robber barons and Astors and Vanderbilts turned Fifth Avenue into a rich man’s playground. It was in 1837, to be exact, that the Delmonico brothers–John and Pietro–emigrated to American and opened a pastry shop in the business district of New York. They quickly prospered, with merchants, bankers, and the like addicted to the deliciously light and airy French pastries and hot coffee that was then a novelty to many Americans. The brothers were frugal, yet visionary, and when they accumulated enough business, they opened a restaurant next door to the pastry shop–Delmonico’s. The lavish French and Italian dishes produced from Delmonico’s kitchens matched the zeitgeist of the proto-Gilded Age of the 1840s and 1850s, where the Erie Canal and railroads created a cohort of men who were millionaires one day and paupers the next. 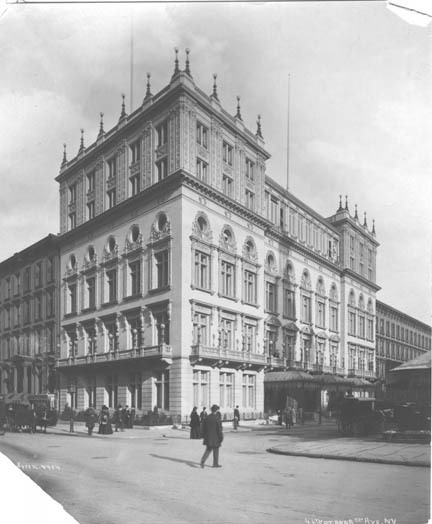 New York’s increasing prominence as the hub of American culture and high life also helped the prominence of Delmonico’s, since visiting European entertainers, artists, writers, and royals gravitated towards finely-cooked meals that reminded them of the best restaurants across the Atlantic. Delmonico’s entered its iconic stage in the 1860s, when nephew Lorenzo Delmonico took the reins and the famed chef Charles Ranhofer entered its kitchens. Throughout the Gilded Age, there were actually multiple Delmonico’s locations across Manhattan, though the flagship location, so to speak, was located in a luxurious building at Fifth Avenue and 26th Street from 1876-1899. As early as the 1850s, Delmonico’s was the preferred site for high society gatherings, from suppers to cotillions. Though the brownstones of Old New York’s Knickerbockers were obviously too small to accommodate large parties, the practice of relatively public events held at Delmonico’s (or its rival, Sherry’s) was retained even after wealthy New Yorkers migrated up Fifth Avenue from Washington Square, where they built astonishing mansions. The reason for this: Ward McAllister, the social arbiter and the Mrs. Astor’s right hand man until his fall from grace in the early 1890s. Delmonico’s under the approval of McAllister, the management of Lorenzo’s nephew Charles (Lorenzo died in 1881) and later Charles’s nephew Charles “Young Charley” Delmonico, and the chef’s knife of Ranhofer, reached it epoch. The 1880s and 1890s saw Delmonico’s as the site of many of the Gilded Age’s most infamous dinners, where multimillionaires splashed out thousands of dollars for the finest food and wine, the best cutlery, and the most luxurious of decor. This was also the period in which the most famous Gilded Age dish, Lobster à la Newburg was invented by Ranhofer. The recipe originated from a sea captain named Ben Wenburg, but when he had a falling out with Ranhofer, the Delmonico’s chef merely replicated the dish with his own tweaks–including inverting its originator’s name! The battle of the restaurant of the Four Hundred was waged in the 1890s, when Louis Sherry opened his eponymous restaurant and specialized in the types of treats and decor that appealed to the ladies of the Four Hundred. Sherry’s was also larger than Delmonico’s, which attracted the growing number of diners annoyed by the long wait-times to get into “Del.” Young Charley responded by closing the location at 26th Street and building a larger restaurant at 44th Street in 1897–though, by this time, competition for the patronage of the wealthy and famous was stiff, with the Waldorf-Astoria opening its doors that same year, and popular night spots known as “lobster palaces” siphoned the more raffish crowd. Nevertheless, if a member of high society or a politician wished to host a stately dinner, Delmonico’s was the only proper place to do it. Most of Gilded Age New York’s popular restaurants fell afoul of Prohibition, but as seen with the 180th birthday celebration, the spirit of Delmonico’s continues to live on! Posted in New York City | Comments Off on Happy Birthday Delmonico’s! « Edwardian Promenade is 10!